Notes: It is a commercially cultivated vegetable. Leaves are sold in vegetable markets in Asia. Young plants are considered a delicacy in China. 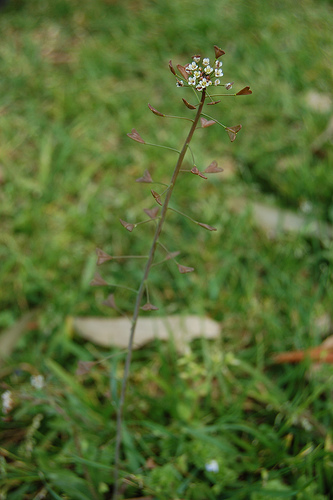 There are 5 Capsella species. It is the second most common weed on earth. It produces a temporary drop in blood pressure. Chemical composition (leaves): Protein = 2.9%. Fat = 0.2%. Carbohydrate = 1.0%; (seeds): Fatty oil = 35.2%. Amino acid = 74.8% – high in Arginine, Aspartic acid, and Cysteine. The plant is reported to contain significant quantities of Vitamin C, lime, and iron; and moderate amounts of Vitamins A, and B1. Edible Uses: The young tender leaves are cooked and used as a vegetable. They can also be eaten raw in salads. They need to be gathered before the flowers appear. The dried seed pods give a pepper like flavouring. The fresh or dried roots can be used as a ginger substitute. Warnings: Caution: It is not recommended during pregnancy. It can cause miscarriages. Signs of toxicity are sedation, pupil enlargement and breathing difficulty. Avoid if on treatments for high blood pressure. Avoid with thyroid gland disorders or heart disease. Possible addictive sedative effects with other depressants (e.g. Alcohol). Medicinal Uses: Antiscorbutic; Astringent; Cancer; Diuretic; Emmenagogue; Haemostatic; Homeopathy; Hypotensive; Oxytoxic; Stimulant; Vasoconstrictor; Vasodilator; Vulnerary. Medicinal Information: Shepherd’s purse is little used in herbalism, though it is a commonly used domestic remedy, being especially efficacious in the treatment of both internal and external bleeding, diarrhoea etc. A tea made from the whole plant is antiscorbutic, astringent, diuretic, emmenagogue, haemostatic, hypotensive, oxytocic, stimulant, vasoconstrictor, vasodilator and vulnerary. A tea made from the dried herb is considered to be a sovereign remedy against haemorrhages of all kinds – the stomach, the lungs, the uterus and more especially the kidneys. The plant can be used fresh or dried, for drying it is harvested in the summer. 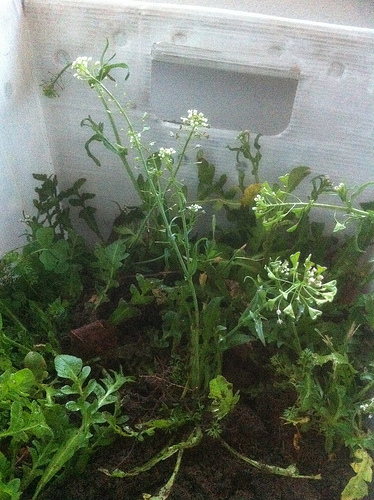 The dried herb quickly loses its effectiveness and should not be stored for more than a year. Clinical trials on the effectiveness of this plant as a wound herb have been inconclusive. It appears that either it varies considerably in its effectiveness from batch to batch, or perhaps a white fungus that is often found on the plant contains the medically active properties. The plant has been ranked 7th amongst 250 potential anti-fertility plants in China. It has proven uterine-contracting properties and is traditionally used during childbirth. The plant is a folk remedy for cancer – it contains fumaric acid which has markedly reduced growth and viability of Ehrlich tumour in mice. A homeopathic remedy is made from the fresh plant. It is used in the treatment of nose bleeds and urinary calculus. The German Commission E Monographs, a therapeutic guide to herbal medicine, approve Capsella bursa-pastoris Shepherd’s Purse for nose bleeds, premenstrual syndrome, wounds & burns. Other Uses: Insecticide; Oil; Soil reclamation. The seed, when placed in water, attracts mosquitoes. It has a gummy substance that binds the insects mouth to the seed. The seed also releases a substance toxic to the larvae. ½ kilo of seed is said to be able to kill 10 million larvae. Plants can be grown on salty or marshy land in order to reclaim it by absorbing the salt and ‘sweetening’ the soil.